We started on 11 May 2007. We embarked the Grande Argentina in Hamburg, which shipped us to Tema, Ghana. It was the idea about moving slowly towards zero. We had three weeks to observe the horizon and to concentrate on the project. After stops in Dakar, Cotonou and Lagos we entered Ghana on 1 June. There we had to find a small but good and fast vessel which could bring us to point zero. That was not an easy affair, because good ships which are affordable are rare in West Africa. After a few days we checked out a vessel called "Tropic Sun", an oil rig supply vessel, which seemed to be the one and only. After times of hard negotiations about the price, especially about the bunker issue, we had a horrible long week of waiting. Then we started on 14 June. Noon: 12kn, true course 180°, gentle breeze, drizzeling wr, slight sea. 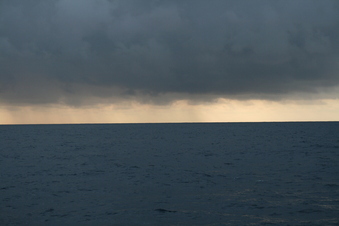 At sunset of 16 June we reached the area of 0N 0E after times of heavy swells and some of us were not in good condition. The zodiac was prepared and we began, accompanied by Kosina Mensah, to navigate by GPS to point zero exactly. The "Tropic Sun" followed us. The current let us drift and the waves were quite heavy, so we had a long time crossing from northwest to southeast and southwest to northeast and so on. After nearly 20 minutes crossing around point zero, we matched zero; the GPS showed N 00°000' W 00°000', it was 8:08h in the morning. We plunged the high vacuum at this point. It sank quickly, to reach the ground it took almost 20 minutes (5000 m deep, the engineer who constructed the ball made the calculation). At the same time we scooped 25l gallons of zero water, which is now available as an edition. Besides that, we took a 360° panorama shot, to show the view from point zero. After that, we returned to the "Tropic Sun" and left home. The project was supported by DAAD, Germany and Kunstfonds Bonn, Germany. More and detailed information about the trip was published in a magazine, you can read it online, see here.